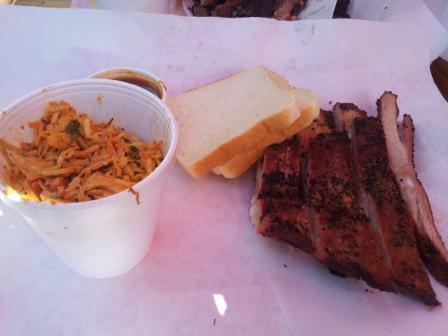 Jambo’s BBQ Shack is a locally owned and operated BBQ restaurant with locations in Rendon and Arlington, Texas. Originally started in the Rendon location where owners Paula & Ashton Lovato purchased the Rendon location from pitmaster Jamie Geer the couple opened a second location in July 2015 in Arlington where the couple resides. It is safe to say Arlington is grateful for this new addition to the local dining landscape. This is evidenced by the daily “Sold Out” signs on many of the offerings. 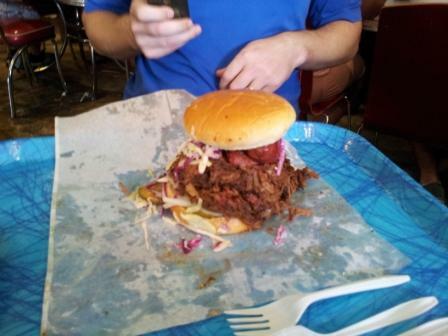 The BBQ here ranges from sandwiches to plates to meat served by the pound. 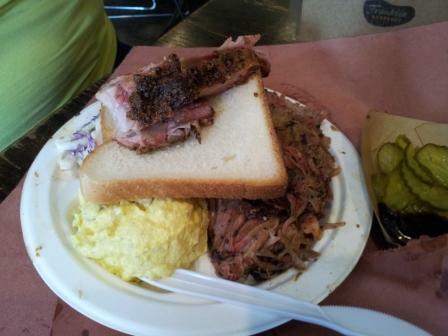 Most mainstays are offered in all formats including sliced and chopped brisket, pulled pork, sausage and bologna. Porks ribs are offered daily as well. Half chicken is a Wednesday special, pork a Friday special. The Signature Dishes are “The Jambo Texan” ($15.00) consisting of all of their standard meats piled high between two pieces of Texas toast and “The Sadie” ($9.00) which is a large baked potato piled high with brisket, sausage, onions, beans, butter, sour cream and cheese. The Sadie along with the two daily specials as well as some of the popular meat items such as the pulled pork are regularly sold out on a daily basis. So come early if you’re looking for something in particular. I’ve visited Jambo’s several times as of this writing including for both lunch and dinnner, dining both on site and carrying out. I’ve enjoyed every single meal from pulled pork to the brisket both ways to the sausage to the ribs as well as every side dish in addition to the jalapeno starter. Everything has been good to excellent with favorites being the pulled pork and ribs. If I had to grasp for a couple of negatives I’d say first up always try to go for an early lunch whenever possible. The meat always seems to be a bit moister and fresher at lunch than at dinner. My two cents worth. Also, the standard side dishes are a bit light on seasoning for my personal preference. I tend to skip them and order the fries instead. Makes for a perfectly satisfying meal for me served that way. Service is quick and fairly efficient. Each visit things get smoother than the last. Jambo’s does not serve alcohol so I believe you can BYOB. I have not to date but I believe I have seen a wine bottle or two on occassion so I believe BYOB is allowed. Obviously bring your own stems if you do. Parking is free in the lot in front. Be forewarned at peak times the lot is always filled to maximum capacity. Happy hunting. Attire is casual. Shorts and a t-shirt are A-OK. Major credit cards are accepted. Conclusion: Jambo’s is a welcomed addition to the Arlington dining scene. We’ve needed another locally owned and operated BBQ restaurant and to have one that is turning out good to really good fare is a blessing to boot. Jambo’s is recommended to highly recommended in my book. We recently traveled to Austin, TX for a 4 day weekend to visit with friends, drink way too much wine and eat until we popped. When traveling through the Texas Hill Country one of our favorite things to do for lunch is to seek out a BBQ joint we preferably haven’t frequented yet. During this trip we managed to sneak in three stops at some rather impressive and now well known BBQ joints: Franklin, JMueller and Louie Mueller. Our first stop of the weekend was JMueller. Located at 1502 South First Street in Austin JMueller has a BBQ meets food truck meets party atmosphere. Set on a dirt lot the pit is located next to a food trailer fronted by picnic benches. You are given a sample of their brisket while you place your order at the front window of the food trailer. Once your order is assembled on the mandatory cafeteria tray topped with butcher paper you swing around to the side window to order your drinks and pay for your meal. Seating at the picnic benches is communal so don’t be surprised when somebody plops down in the empty spot at the table next to you. On this visit we sampled the Beef Brisket (you order it moist or lean according to your preference), the Beef Rib and the Pork Spare Ribs. 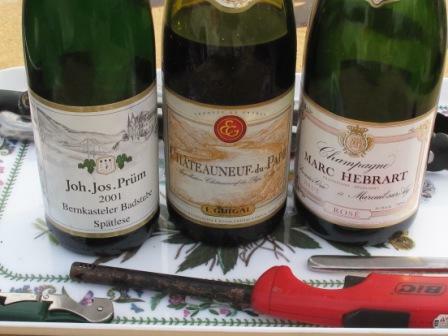 Everything was very good to excellent with the Beef Brisket and Beef Rib being clear stand outs. The “moist” beef brisket was, well dare we say it, moist with the best bark of the three briskets we sampled over the weekend. 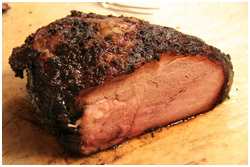 The beef rib was similar in style to the brisket with a good bark but a bit leaner cut of meat. The pork spare ribs were flavorful and tender but not quite as falling off the bone tender as I tend to prefer. The sides are very good and some of the more interesting of the weekend such as the Chipotle Cole Slaw. JMueller is definitely a winner in our book and highly recommended. If you don’t want to stand in a line 20-30 people deep get there right at 11AM and you should be rewarded with a decent parking spot and a fairly short wait. Major credit cards are accepted. Our second stop of the weekend was Franklin. 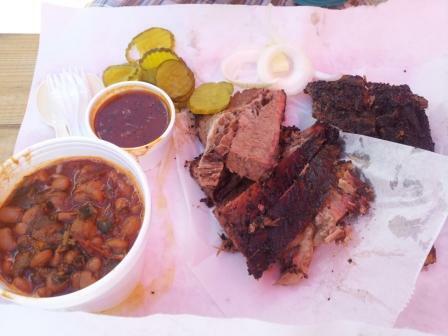 Located at 900 E. 11th Street in Austin Franklin is a shooting star on the BBQ circuit. No matter what day of the week (we visited on Sunday) if you’re not in line by 10:15AM for their 11AM opening time then you’re likely standing in a slow moving line that is at least 50 people deep and about 2 hours in length. Get in line much later than that and the odds greatly increase that by the time you make it to the carving station they’ll be out of at least one of your selections. That is how Franklin operates: they make the most that they can make themselves each given day without sacrificing their excellent quality and when it sells out that is it. Turn out the lights and the party is over. They close the doors for the day and it isn’t unusual to start running out of items by 1PM each day. Was it worth the 90 minute wait? You bet your sweet you know what it was worth the wait. 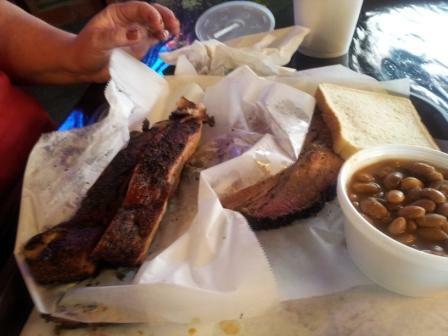 We managed to snag orders of the beef brisket, pork spare ribs and pulled pork (who says Texas doesn’t have pork BBQ?). Every cut of meat was excellent. EVERY CUT. Although I might give JMueller a slight edge for the bark on their brisket overall without a doubt in my mind the brisket at Franklin is the best I’ve sample in a very long time. Moist and flavorful throughout it was simply excellent from the first to the last bite. The pork spare ribs were the best flavored ribs I had of the three places sampled this weekend and without a doubt the most tender. When I picked up the bone to eat them the meat literally fell off the bone under their own weight. Wrapping up with the pulled pork it was also some of the best pulled pork I’ve had in a very long time. The beans were also very good although I might give a tiny edge to the beans at JMueller. Needless to say Franklin is highly recommended in our humble opinion. Be sure and get there very early, bring a lawn chair and a book to read to soak up the experience. Major credit cards are accepted. Our final stop of the weekend was Louie Mueller. 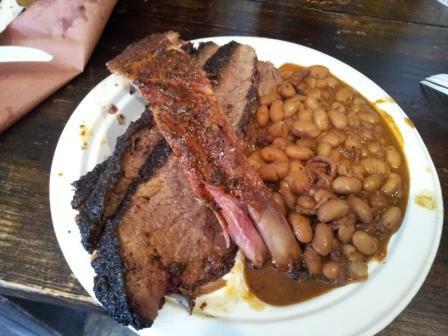 Located in nearby Taylor, Texas Louie Mueller has been serving up excellent Hill Country BBQ for over 60 years. The original “sampler of beef brisket” you’re given a piece of their excellent brisket to eat while you make your selections at their indoor pit. We opted for the beef brisket (moist), beef rib and two pork ribs. The beef brisket was very good to excellent with a nice balance of bark on the outside and tender moist meat on the inside. The beef rib is an absolute monster coming in around a pound and a half just for one beef rib. It was also very flavorful with fork tender meat throughout. The pork ribs were probably my second favorite of the weekend with a bit lighter smoke than I prefer but much preferred fork tenderness throughout. The beans were good as well. I’d put Louie Mueller down as my third favorite of the weekend but that is almost like saying “this is my third favorite child”. Louie Mueller is recommended in our book. Major credit cards are accepted. Franklin, JMueller and Louie Mueller BBQ: all recommended to highly recommended. Lockhart Smoke house is Jill Grobowsky Bergus’ and her husband Jeff’s Central Texas BBQ transplant located in the very active Bishop Arts District of Dallas. Jill is the granddaughter of Edgar Schmidt. The Schmidt family owns and operates the well known Kreutz Market in Lockhart, serving up good old Central Texas styled BBQ since 1948. 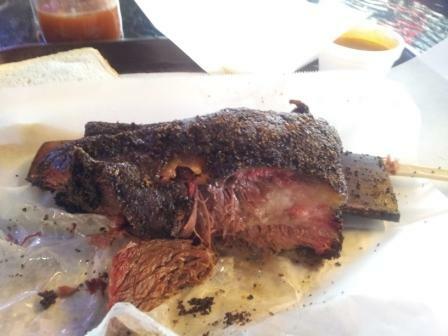 Think of Lockhart Smoke House in Dallas as Jill’s and Jeff’s “Kreutz” outpost in north Texas. Lockhart Smoke House is the only place in north Texas that carries the well known Kreutz Market sausage. Like most Central Texas BBQ places you walk to the BBQ pit to pick out your selections for your meal. 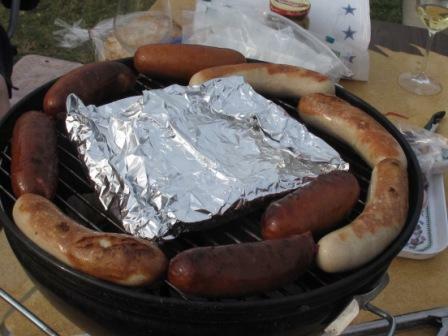 Meats are served by the weight, sometimes by the ring if it is sausage or half a bird if it is chicken. Once you place your orders your selections are hand cut by the pit crew and wrapped in butcher paper before being weighed at the register. Extra butcher paper serves as your plate when eating at the table. In the case of Lockhart (and Kreutz) you’re not allowed a fork or sauce. Your fingers serve as the fork and the smoke of the pit serves as your sauce. You’re welcome to bring your own utensils or you can donate a dollar to a local school if you’d like to grab a plastic fork from Lockhart. Our selections for lunch were a half pound of clod with extra bark, a Kreutz Jalapeño sausage and roughly 4-5 pork spare ribs. The clod (similar to brisket but a bit beefier and leaner than most briskets) was pretty much forked tender, well marbled with good to very good flavor. The pork spare ribs were very flavorful and smoky but were much firmer in texture than they should have been. They should’ve been cooked “lower and slower” to get that falling off the bone tenderness while retaining that lovely moist and smoky essence. The Jalapeño Sausage was good, not nearly has fatty as many sausages on the market. However, they are a bit on the mild side for Jalapeño Sausage so be forewarned if you’re looking for a good burn. Everything was good but the next visit will be brisket, pork chops and chicken for comparison purposes. We also opted for sides of macaroni salad and BBQ beans. Bread is free, wrapped in the butcher paper with the meat. The sides were basically average in my opinion, mostly serving as filler. I’d rather order extra meat myself. The service was friendly and engaging, bearing in mind it is basically a self serve process from beginning to end. You stand in line for the pit, they hand you your food and then you take it to your table, grab your drink yourself, etc… However, at the pit, bar and table the staff made an effort to follow up and make sure everything was satisfactory. The restaurant has a full license so BYOB is not allowed under state law. If you want an alcoholic beverage you order that separate at the bar instead of the main register. Beers are by the bottle, none on tap. There are also whiskeys and other well drinks available for purchase. Lockhart is open seven days a week from 11AM until they sell out of BBQ. Attire is casual. Major credit cards are accepted. Free parking is available in the area but parking is scarce due to the density and popularity of the Bishop Arts District so be prepared. Lockhart Smoke House: recommended. Still not my personal favorite in Central Texas styled BBQ but without a doubt it is good, solid BBQ that you don’t normally get around this part of Texas. A buddy of ours we’ll call “ArieS” flew into town this past weekend to attend the Dallas Cowboys football game against the New York Midgets. Right about now you’re saying “So what? I know lots of people that fly into football games.” Well in this particular case it was ArieS’ very first Cowboys game. To make things a little bit more interesting ArieS is French. You’re probably thinking to yourself “There is a Frenchman roaming around this planet that loves American Football? Surely you jest! Sacrebleu! (That’s French folks)”. It seems that ArieS watched his first Cowboys game while still living in France around 16 years ago and has been a Dallas Cowboys fan ever since. I want to say that it was around eleven years ago he obtained a work visa and moved to Miami. After a short stint in Miami he pressed onto Orange County in California and has never looked back. So here you have a French ex-patriot die hard Cowboys fan living in Chargers and Raiders country flying half way across the country to catch a game of his beloved Cowboys against the much despised Giants of New York. You have to love that! So this past Monday it was ArieS’ very first Cowboys game ever after being an avid fan from afar for over 16 years. Needless to say we couldn’t let ArieS fly half way across the country and just pop in to see the game. He needed the full Cowboys experience. So we did the old rendez-vous (that’s more French folks) beforehand and drove ArieS to Rangers Lot A four hours before game time. I mean this guy is a Cowboys virgin so if we’re going to pop his proverbial Cowboys cherry we’re going to do it all the way. This guy is going to tailgate Cowboys style. So we backed into our grassy parking spot (all tailgaters at the new stadium must be in a grassy area which is a complaint for a future column Jerry Jones) and quickly setup shop. Booze? Check. Grill? Check. More booze? Double check. You get the picture. So we fired up the grill while sipping some Champagne and chatting back and forth with our neighbors that were naturally also tailgating. 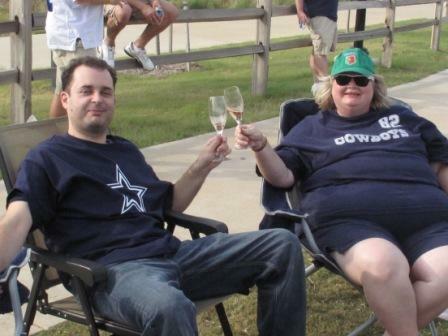 That’s the beauty of tailgating, the camaraderie. Everybody socializes, shares food, supplies, throws footballs back and forth and trash talks to anybody wandering by wearing an opposing team’s jersey. Sorry though folks, there were no tasting notes taken for these. This one was all about sharing the tailgating experience with newbie ArieS. 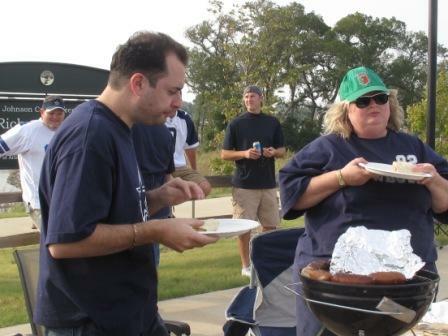 So ArieS, if you’re lurking out there, I’m glad I was there when you finally popped your tailgating cherry. 😉 Félicitations and we’ll see you next year for your second Cowboys game. We’ll be tailgating of course. When asking those in the know about where good, authentic Korean food can be found in the Dallas area the most likely recommendation you would hear is Seoul Garden. This authentic Korean eatery boasts tables with honest to goodness charcoal barbecue pits built in where diners can grill their own barbeque right at the table. This unassuming restaurant is tucked in behind a convenience store at the corner of Reeder and Royal barely a block east of I-35. Drive slow as you approach the light at Reeder and be ready to turn, otherwise you’ll likely drive right by it without seeing it. Korean-style pancake mixed with vegetables. Steamed meat & vegetable dumplings. Fresh short ribs marinated in house special sauce. Thin sliced boneless beef marinated in house special sauce. Sautéed spicy pork and vegetables with spicy sauce. All of the food was well prepared and very tasty. The fresh short ribs and thin sliced beef are both on the barbeque menu so we prepared them ourselves at the table using the charcoal fired grill. Our waitress naturally helped throughout the process as needed. Both meats were very tender cuts of beef and the special sauce was quite good with the meat. The spicy pork and eel were prepared by the kitchen staff and both were very well prepared. Beware that the spicy pork has a tasty but slow burn to it. The traditional Korean sides were all fresh with the sautéed broccoli and cucumber in spicy sauce being the stand outs. Complimentary slices of fresh watermelon were given to the table after dinner for dessert. Service was adequate to good. We had to flag our waitress down a few times for extra drinks but she was spot on helping us work with the grill at the table. Our party of six split all of the food and the bill evenly. Even accompanied by several beers to wash down some of the spicier offerings and tacking onto the total a generous 20% tip the total was a respectable $40.00 per person. Seoul Garden has a limited beer and wine list. You must sign up for a club card in order to purchase alcohol but the fee is refunded with your first purchase of a beverage. They do not allow BYOB. Seoul Garden is open Monday through Saturday from 11AM to 11PM for lunch and dinner. Major credit cards accepted. Attire is casual.